There are a lot of doom and gloom stories in plant biosecurity in New Zealand. There are now more naturalised vascular plant species than native species and the invasion has yet to slow, fueled by the large diversity of ornamental garden plants. New woody plant naturalisations are increasing exponentially. A lot of the recently established weeds have hardly begun to realise their potential distributions and abundances. When you think long-term like ecologists do, it’s easy to get depressed. But this is not a doom and gloom story. This is the story of one woody weed that won’t realise its full potential in New Zealand. We got a glimpse at what it was capable of, and, with a substantial amount of sweat and herbicide and good fortune, it is now on the decline. This is the story of wild kiwifruit, the woody weed. It was presented last week to the IUFRO International Forest Biosecurity conference by Lincoln University's Jon Sullivan together with John Mather, pest plant coordinator at Environment Bay of Plenty. First, we should introduce the botanical characters in the story. It comes as a surprise to many non-New Zealanders to learn that the famous green kiwifruit is not a New Zealand native plant species. Actinitia deliciosa is a vine of mountainous temperate forests in China, climatically not dissimilar to much of New Zealand. New Zealand's clever breeders bred the commercial selections of kiwifruit from seed imported from Asia. When we were young, it was called Chinese gooseberry. In China, where kiwifruit is native, it is called monkey peach (mihoutao). They were named kiwifruit by clever New Zealand marketers. Zoologically challenged Americans now just call them kiwis. It may also come as a surprise that there is more than one species of kiwifruit. Three are now in commercial production, including the more recently planted yellow-fruited Zespri Gold (Actinidia chinensis) and hairless grape-sized Kiwiberry (Actinidia arguta). Actinidia is a genus of over 70 temperate and subtropical species of Asian woody vine, and several additional species are being trialled in New Zealand for their commercial potential. Unfortunately, kiwifruit have been as great a success in the wild as they have been economically. 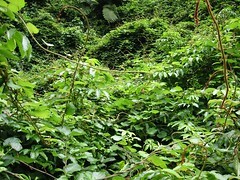 Scattered wild plants of A. deliciosa were known in New Zealand in the 1980s, soon after the kiwifruit market went global, and by the mid-1990s, alarm bells started ringing. By 2001, it was known from more than 500 sites in a <100 km2 area around Te Puke, Bay of Plenty, the historical core of the industry. Wild vines were found strangling and smothering young native trees and Pinus radiata pines and invading tree-fall gaps in mature native forest. In one gully of native forest, the weight of one vine snapped the top off a small tawa (Beilschmiedia tawa) tree and killed it. Large vines were reaching the tops of mature pines and spreading to adjacent trees. In one gully after a crop of Pinus radiata had been felled, there was on average one wild kiwifruit seedling every 2.5 m2. Actinidia deliciosa was clearly a woody weed, and its population was growing. Our searches of the native scrub in the gully next to the Te Puke kiwifruit trial orchard also uncovered wild vines of A. chinensis, A. arguta, A. polygama, and A. eriantha. Clearly, many Actinidia species liked the New Zealand environment. So, what to do? Controlling thousands of wild vines in at least hundreds of sites was a daunting proposition. You could be forgiven for thinking we were too late. Undeterred, John Mather led trials in the late 1990s to determine how easy kiwifruit is to kill. Luckily for us, it was receptive to readily available herbicides. A survey of wild vines around Te Puke revealed that there were many thousands of wild vines and most individuals were only a few years old and not yet at fruiting age. If we were going to act, now was the time. In each each growing season from 2001/2002 onwards, two weed contractors have since had the sole mission of seeking and destroying wild kiwifruit. This has been a joint initiative of NZ Kiwifruit Growers, Inc. and Environment Bay of Plenty (see our 2007 article in Acta Horticulturae for details). This have been a fruitful combination of expertise and resources from industry and regional government (or perhaps it should be "fruitless", since one objective has been to remove fruiting individuals from the wild population). To date, 29,111 wild vines have been killed and the wild population is declining exponentially. Extrapolating the control curve out beyond the data (which is always somewhat sketchy) suggests that there may only be 5000 more wild vines out there to kill, excluding new recruitment. Importantly, almost all of the large wild vines have now been killed meaning that wild fruit production has been largely curtailed and the population has been castrated. There is little evidence for a seed bank beyond about 5 years in this species, luckily, so the programme is moving into a phase of catching the juveniles before they can fruit. We’re not completely out of the woods yet. Much of the rapid spread of wild kiwifruit in the 1990s and 2000s can be attributed to the practise of dumping reject fruit onto surrounding farms as stock food. These fruit are also fed on by birds, such as the native silvereye (Zosterops lateralis), which David Logan of Plant and Food Research showed are effectively dispersing the seed into surrounding wildlands (see the New Zealand Journal of Ecology). While we are still figuring out details of the ecology of wild kiwifruit, the broad outline of the story is clear. This has been the rise and fall of wild kiwifruit in New Zealand. By the late 1990s, it was one of the most abundant woody weeds in the Bay of Plenty. With sustained control, it will soon become a minor weed of the region and one far more affordable to contain. With sweat and herbicide, and a weed amenable to control, we can stop even established weed populations. It seems that we're not out of the kiwifruit infested woods just yet. According to Radio New Zealand News (9 April 2009, Link), the kiwifruit marketing company Zespri is recommending that growers leave up to a million trays of fruit unharvested this year. Why? To maintain high prices. "NZ Kiwifruit Growers Inc chairman Peter Ombler says surplus fruit will be left to drop from the vine and mulched." If that happens, it will mean many thousands of seeds will be dispersed onto neighbouring land by birds, exacerbating the wild kiwifruit problem. It's this kind of practice that made wild kiwifruit into one of the worst woody weeds of the Bay of Plenty region. Environment Bay of Plenty biosecurity staff tell me that they will be contacting the Kiwifruit Growers Association to see if they can work out a more environmentally benign way of sustaining fruit prices during the current recession.